Nearly 20 years ago, researchers conducting experiments on Lawrence Livermore National Laboratory's (LLNL) Nova Petawatt laser system—the world's first quadrillion-watt laser—discovered that when the system's intense short-pulse laser beams struck a thin foil target, an unexpected torrent of high-energy electrons and protons streamed off the back of the target. Earlier this month, an international team of researchers used the Nova Petawatt's successor, the National Ignition Facility's (NIF) petawatt-class Advanced Radiographic Capability (ARC), to begin developing an experimental platform that promises to turn Nova's surprise discovery into a powerful new source of protons to study the extreme conditions deep inside the planets and the stars, enhance targeted tumor therapy and advance the frontiers of high energy density (HED) science. In two NIF Discovery Science experiments, the researchers fired four ARC beamlets at a 33-micron-thick titanium foil, setting up a strong electrostatic sheath field called a Target Normal Sheath Accelerating (TNSA) field perpendicular to the target (normal is a geometric term for perpendicular). As the field blew away from the back of the target, it accelerated high-energy protons and ions from the contamination layer of proton-rich hydrocarbons and water coating the target's surface, all moving rapidly in the same direction. "The results were as good as we had hoped for," said LLNL physicist Tammy Ma, the campaign's principal investigator. "It was definitely a win. ARC is not as intense as a lot of other short-pulse lasers, so some in the community were concerned that the intensities might not be sufficient to generate these beams. But (the result) was more protons than we expected with energies approaching 20 MeV (million electron volts)—definitely a source that will enable other applications and cool physics." 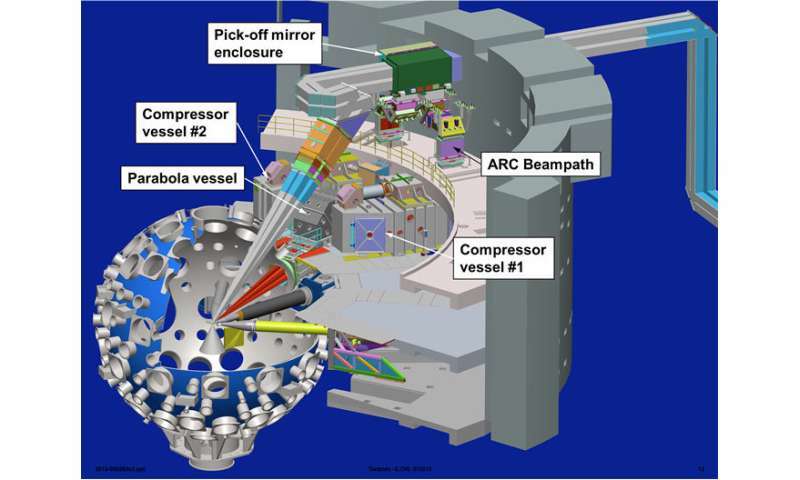 In the experiments, two of NIF's 192 beamlines were split to form the four short-pulse ARC beamlets. 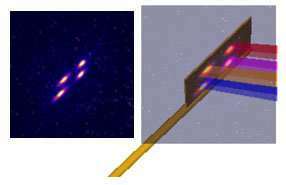 The beamlets were fired simultaneously for 10 or one picoseconds (trillionths of a second), generating up to 200 terawatts (trillion watts) of power per beamlet. The total of about 700 terawatts in the second experiment was the highest peak power yet generated on NIF. ARC's high peak power is made possible by a process called chirped-pulse amplification, in which a short, broadband pulse generated by an oscillator is stretched in time to reduce its peak intensity, then amplified at intensities below the damage threshold in the laser amplifiers, and finally compressed to a short pulse and highest peak power in large compressor vessels. The new Discovery Science platform, supported by LLNL's Laboratory Directed Research and Development (LDRD) program, is designed to study the physics of particle-beam generation at previously unexplored ultra-high short-pulse laser energies and long pulse durations. Coupled to NIF's 1.8 million joules of ultraviolet energy, the capability will enable myriad HED applications and allow the creation and study of extreme states of matter. NIF is the world's only facility capable of achieving conditions like those in the interiors of stars and giant planets. Using ARC short-pulse generated proton beams for ultrafast heating of matter to extreme states will enable opacity and equation-of-state measurements at unprecedented energy-density states. In addition, "protons deposit their energy very specifically," noted LLNL postdoc Derek Mariscal, lead experimentalist for the project. "That's why protons are promising for applications such as tumor therapy. You can send a beam of protons toward a tumor and get it to deposit all of its energy exactly where you want it to without damaging other areas of the body. "Likewise with a solid material," he said. "(The proton beam) deposits its energy where you want it to very quickly, so you can heat up a material really fast before it has time to hydrodynamically expand—your material stays dense, and that's the name of the game—high energy, high density." 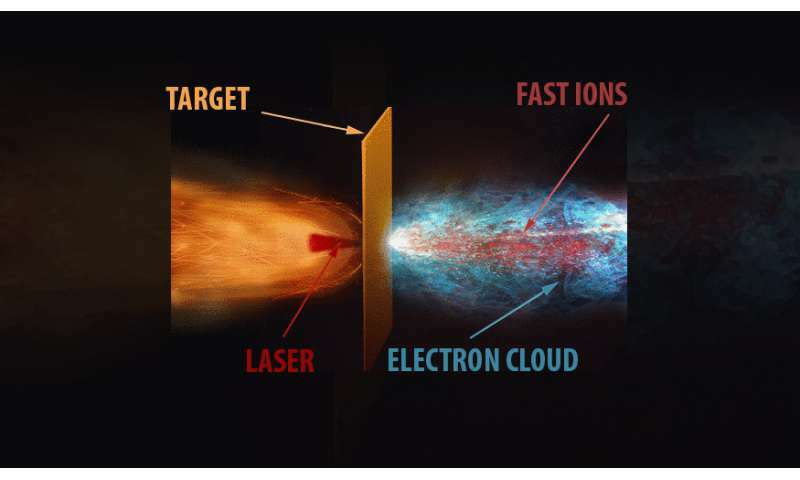 Once the proton-acceleration platform has been demonstrated and understood, Mariscal said, the next step in the project will be to fire the ARC beams at a deuterated carbon (CD) foil to generate a beam of deuterons. "You could impact those onto a second foil, like lithium fluoride or beryllium, and then you get a beam of neutrons—a real, laser-like neutron source, only using two beams of NIF instead of all 192." And how does this help with fusion?